The kitchen island has become the ‘must-have’ item for the modern kitchen. Why? First, they add valuable storage, something that everyone is looking for. They can complete the always important ‘work-triangle’ (the sink, the stove, the fridge all placed in a triangle pattern to increase kitchen efficiency). They are multi-function. Work area, eating area, storage area, and gathering area (host a dinner party and see how many times people gather around the island). 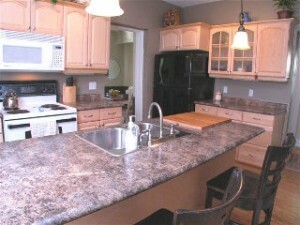 Quite simply, a well designed island can make your kitchen sizzle, maximizing value and lifestyle function. Size: an effective island needs to be a minimum of 4 feet long, and 2 feet wide (wider if you plan on multi-levels). If you have inadequate space, the island will detract from your kitchen. The smallest I installed was 10 feet by 12 feet (see picture above). If you have a galley kitchen (long and narrow) then an island just won’t work for you. Ensure that your island doesn’t impede foot traffic. If people have to move around it to get through your house, it has become an obstacle. Ventilation: If your stove is set in your island, you have to deal with odors, and more importantly, moisture. Several island-based stoves have down vents. Otherwise, you might have to have a vent hood. Lighting: Islands need light, commonly solved with pendants lights. Height is an issue here as you don’t want to bonk your head if it’s an eating or work area. Electrical and Plumbing: Like any project, plumbing can become an (expensive) issue if not planned correctly. Dishwasher? Sink? All require waste lines plus supply lines. Do you have access below (unfinished basement? ), otherwise, alterations on the lower floor will be required. And at the very least, you’re going to want a single electrical outlet for small appliances. Counter tops – What’s the main function of the island? Food prep? Stove? Storage? For cooking, I’ve installed a maple butcher’s block counter, which was very economical compared to the natural stones. It requires more care (oiling, cleaning, sanitation). Every couple of years a light sanding will make it look as good as new. Natural stones can be very expensive (especially with specialized edging and cutouts).